Comments: “the Brotherhood of Evil Mutants!” Here we have the original X-Men training. Cyclops, Marvel Girl, Iceman, Beast and Angel. 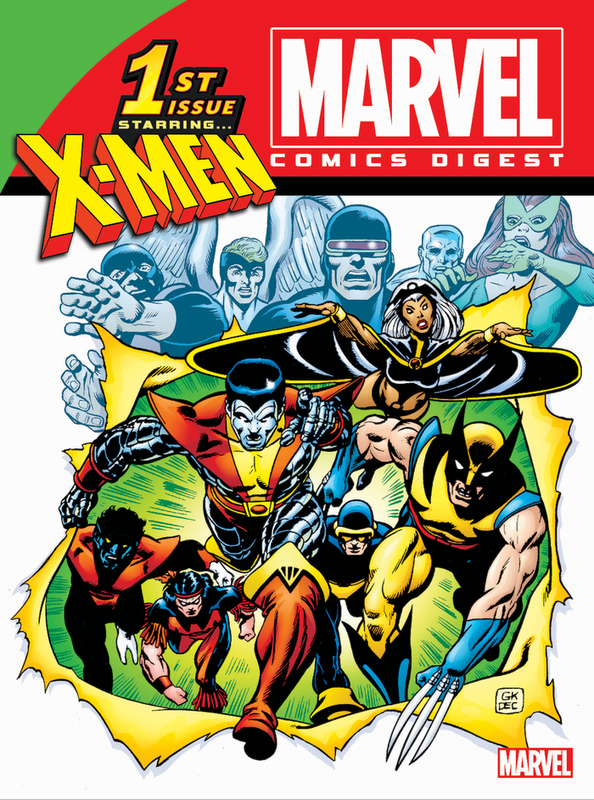 The Brotherhood of Evil Mutants is far different in how they act towards each other than the X-Men. These two teams do do battle and both show off their powers. The illustrations do show off their powers beautifully. The personalities of the X-Men and the evil mutants is really gotten into in the story. There is action but the story does focus more on developing the characters. “Trapped: One X-Man!” Professor X is powerless and Magneto and his evil mutants are searching for the X-Men. The Toad lures the X-Men into a trap and the fight is on. This is where Quicksilver and the Scarlet Witch were part of the evil mutants. Professor X well is not and was not so powerless after all. He does make a great teacher. “Enter, The Avengers!” Professor X faces Lucifer. This leads to the X-Men battling the Avengers. They are illustrated in all out action. Lucifer is a foe that is hard to defeat. “X-Men 101” The artwork is gorgeously done here. The planet creature they fight is just there with no explanation. It is a great battle to see. We do get an explanation for that alien plant creature. But the story is about Iceman writing to his folks. He is a loving son almost as much as he is an X-Men. “The Bird, The Beast and The Lizard” The X-Men visit Dr. Curtis Connors. The Beast and Angel battle the Lizard underwater. It is drawn great this fight as they go back and forth. The older yellow and black costumes are amazing to see. Having Scott and Jean spending some quality and romantic time alone is so nice to see. Scott smiling and having fun is a rare thing indeed. “From the Ashes” Aw Jean meets her childhood best friend Annie at the mall where as kids they hung out. This is a powerfully emotional story looking back at Jean’s childhood and one experience. Jean here takes a huge step in moving forward with her life. The art is pale and to flat and lifeless but the story makes up for it in spades. “Kitty’s Fairy Tale” Kitty tells Illyana a bedtime story. Pirate Kitty and Colossus are drawn as dashing pirates. All the X-Men play parts in the story. The fairy tale story of Kitty’s ends as most do. Kitty the X-Men she did deliver a wonderful tale. The whole issue was illustrated lovely as well. “The Buddy System” Wolverine and Kitty are sent on a mission. Wolverine learns fast that Kitty is stubborn. Great art on the two main characters here of Wolverine and Kitty. Wolverine is also stubburn but these two do start to bond. The hard as nails fighter and the sweet little girl form a friendship that will last forever. A very emotional and heartwarming story. “Marvel Adventures Spider-Man” Here Spider-Man and his girlfriend Chat are reuniting and getting closer. The X-Men are spying on Spider-Man. But it turns out Chat is who they were looking for. Chat though has something going on in her life that is a mystery. The X-Men though do leave her alone when she tells them to. The Marvel Masterwork Pin-Ups of the original X-Men by Jack Kirby and Chic Stone are truly masterpieces of art.